The Force is strong with these hashtags! Who doesn’t love Star Wars? Following the adventures of courageous heroes and dastardly scoundrels in a galaxy far far away, the multi-generational film series has garnered millions of fans all over the world. With the marketing ramping up lately, we decided to take a look at how Star Wars hashtags were performing on Twitter. 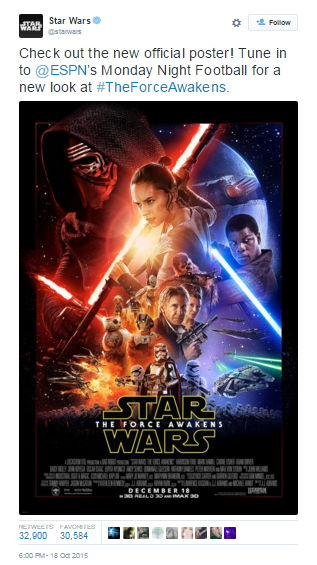 Using Sotrender, we looked at the most popular Star War tweets and hashtags, as well as the performance of the film’s trailers. And, just for fun, we examined the shared interests of Star Wars fans. Sound interesting? Read on to see what we found out! 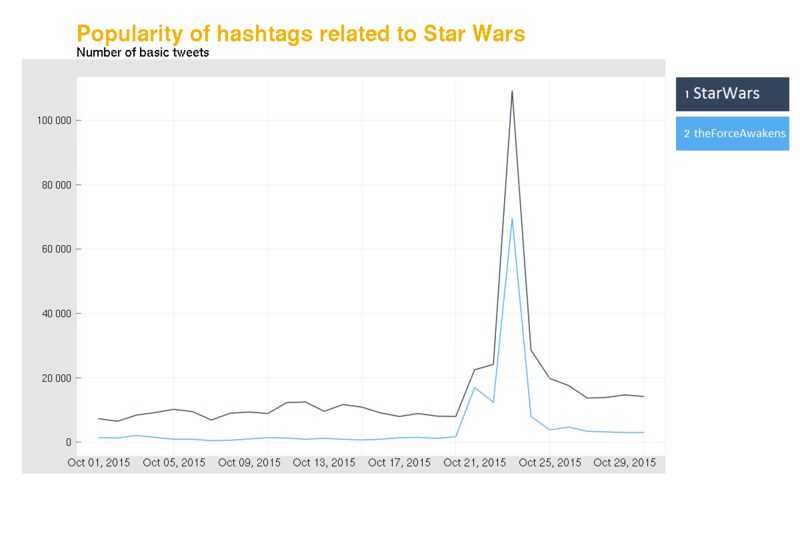 Using Sotrender to analyze Twitter hashtag stats, we took a look at the popularity of Star Wars hashtags. To no surprise, Star Wars hashtags were used the most during the release of the first full-length trailer. The trailer was uploaded to the web on October 19th. All it takes is one well placed trailer release to blow up a marketing campaign. As we can see on the chart, the use of Star Wars and The Force Awakens hashtags blasted up past the 100,000 mark after the 19th of October. With a mix of well-known characters and set pieces alongside brand new ones, the trailer got people talking about Star Wars like never before. 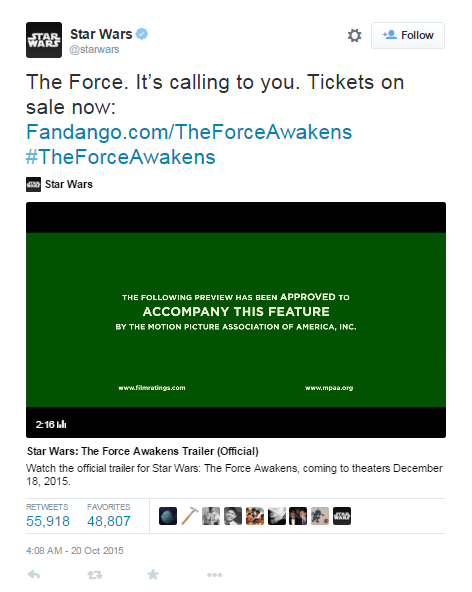 Of these thousands of tweets, the one from the official Star Wars page in which they shared the trailer with their followers garnered the most likes and retweets. 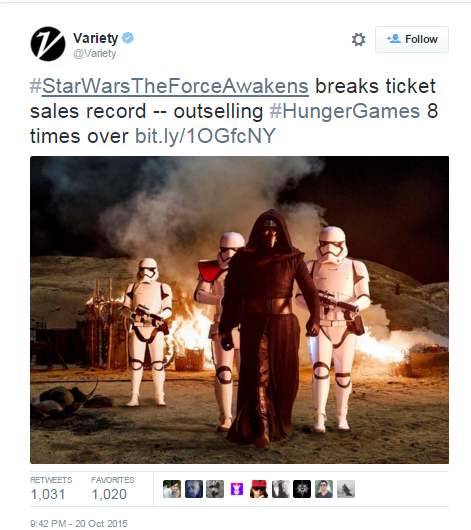 The Force Awakens marketing campaign had been fairly low-key up until the release of the trailer. But since then, it’s turned on it’s hyperdrive and gone into hyperspeed. New posters, interviews, tv spots, international trailers, toys, and more have been bringing Star Wars back into the public eye. And Twitter has been the perfect place to help spread this awareness. There’s a notable absence of Luke Skywalker on this poster, don’t you think? It’s become so popular that it’s shattering records for the most amount of tickets. And not in a modest way – They beat out previous record holder The Hunger Games eight times over. 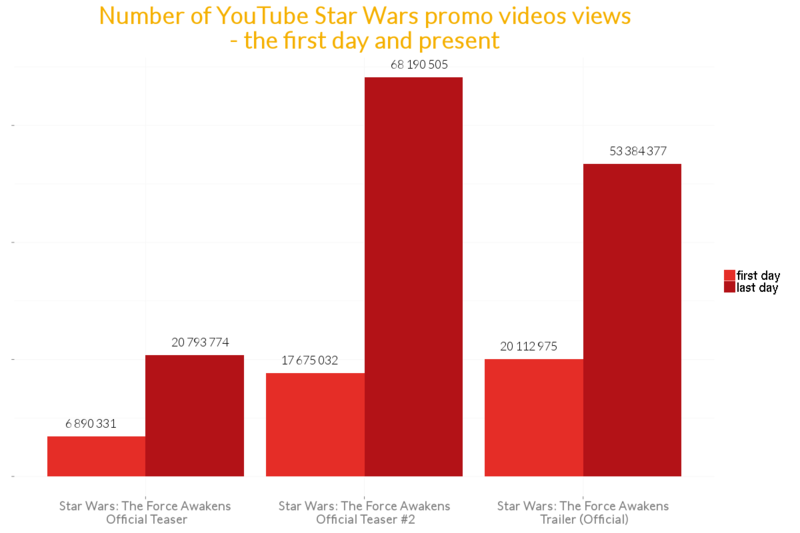 The Star Wars trailers have been a resounding success on Youtube. We analyzed the performance of each of the three official trailers on Youtube, seeing how they’re popularity has grown overtime. We compared how many views they gathered on their first day of release with the amount of views they had during the end of our analysis (October 29th). Each trailer was quite successful upon it’s initial upload date, with the full trailer being the most successful. However, it wasn’t as large of increase between the second teaser and the full trailer as there was between the first teaser and the second one. This is likely due to the second teaser giving us the first glimpse of returning favourites Han Solo and Chewbacca, played by Harrison Ford and Peter Mayhew. By the end point of the analysis, the second teaser has gained the most youtube views. However, the full-length trailer still has momentum and will likely surpass the popularity of the second teaser. There are a lot of popular science-fiction films at the moment. Are Star Wars fans loyal, or are they turning coats more often than Lando Calrissian? Another other big movie from this year was undoubtably Avengers 2: Age of Ultron. Next year will see an anticipated Batman v Superman movie as well as 3rd Star Trek film (produced by no other than JJ Abrams – The Force Awakens director). Which is quite notable, since it’s pretty well known that Trekkies and Star Wars fans don’t get along too well. Just as DC and Marvel fans don’t. 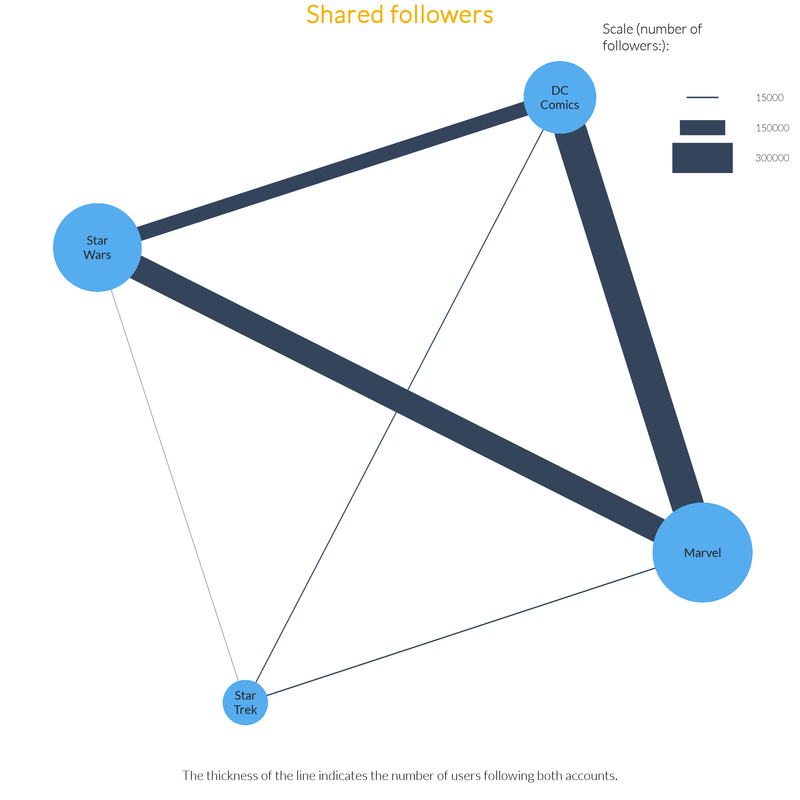 You can never be to sure though, so we decided to check if it’s true by conducting a shared interest analysis. As we can see on the chart, it’s true that people interested in Star Wars are not interested in Star Trek. However, they are interested in the Marvel films, apparently holding less annimosity to the comic book realm. And it seems comic book fans are more willing to share their attention. Contrary to the popular belief, there are very strong ties between the DC and Marvel fanbases. It seems fans of Marvel are also very often fans of DC comics. The Star Wars: The Force Awakens marketing campaign is an intriguing one to follow. It didn’t really get going until the release of the official full-length trailer, and now it’s an unstoppable machine. It’s also impressive that with all this promotion, they’ve also been able to keep so much about the film tightly under wraps. Mystery surrounds this film, such as the basic plot of the film, the roles of certain actors, and the odd absence of Luke Skywalker (played by Mark Hamill) in the trailers and posters. The anticipation is higher than ever. Let’s hope the film doesn’t disappoint.